Network issues got fixed by rebooting the machine and if it has more than 2-3 days uptime it drops to 5-10mbps again. About the CPU usage it was from the java, didn't thought it might be from it but yeah..
Thread can be locked, thanks for the advices and by the way support here on forums is much faster than waiting 2 weeks on emails, thanks for that too. Alright, thanks. Will try it out then reply with results. well, the 100% CPU is a very clear one : you need to find out what process is taking all that CPU time. For the CPU, the bottom part of your screen shot will tell you which process is consuming the core. From there you can back track on the process or see the syslog if there is any issues. If you wish, you can boot to the rescue mode as it will boot from the network. It will load another OS, Is the core consumed under rescue as well? The rescue also allows you to test the bandwidth as well. Hello guys, i'm posting here to see if any other customer expirienced these issues. I sent them email but as far as i know how fast they are at responding, the server will expire twice. 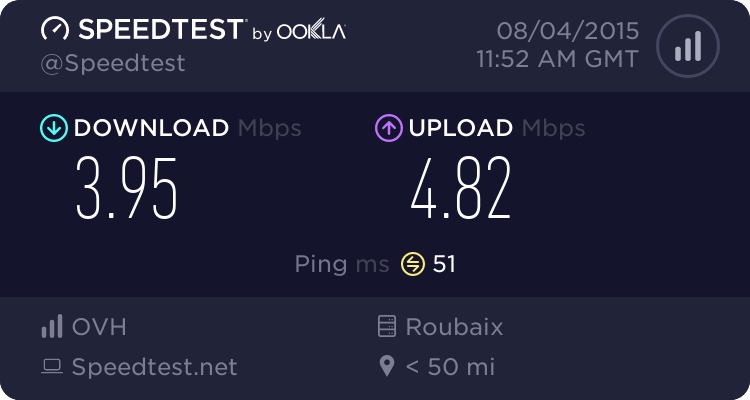 2nd is the extremely low network connection. Any ideas or solutions i can try?